History Nebraska was founded in 1878 as the Nebraska State Historical Society by citizens who recognized Nebraska was going through great changes and they sought to record the stories of both indigenous and immigrant peoples. It was designated a state institution and began receiving funds from the legislature in 1883. Legislation in 1994 changed History Nebraska from a state institution to a state agency. The division is headed by Director and CEO Trevor Jones. He is assisted by an administrative staff responsible for financial and personnel functions, museum store services, security, and facilities maintenance for History Nebraska. History Nebraska collects, preserves, and opens to all, the histories we share. History Nebraska was founded in 1878 to "encourage historical research and inquiry, spread historical information . . . and to embrace alike aboriginal and modern history." In 1883 it was designated a state institution and began receiving financial support from the legislature. Legislation in 1994 changed History Nebraska from a state institution to a state agency. History Nebraska is governed by a fifteen-member board of trustees, twelve elected by History Nebraska members, and three appointed by the governor. Preservation: The preservation of Nebraska's past is the legacy of its people. Public Service: History Nebraska exists to serve. Trust: The History Nebraska collections are held in trust. Excellence: History Nebraska adheres to the highest professional standards in everything it does. For contact information for all departments, please click here. Archeology is the Nebraska clearinghouse for prehistoric and historic sites, including those threatened by highway and other construction. Archeological resources are investigated under provisions of the National Historic Preservation Act. The NSHS Collections Division collects, preserves, and provides access to materials that document the human history of Nebraska. 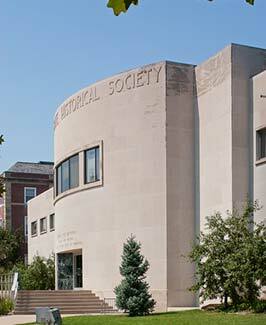 The Gerald R. Ford Conservation Center, adjacent to the Ford Birthsite and Gardens, Omaha, provides modern laboratories for the conservation of historical documents, textiles, and museum objects. The Society, whose director is state historic preservation officer, implements Nebraska's compliance with the National Historic Preservation Act of 1966. Related responsibilities include the Nebraska Historic Buildings Survey, the National Register of Historic Places program, archeological survey, review and compliance for federal undertakings, review of projects seeking preservation tax incentives, and local participation in historic preservation. The division publishes a quarterly magazine, Nebraska History, and books and documents on Nebraska and Great Plains history. This division collects, manages, and preserves a wide spectrum of published and unpublished documentary materials, and provides access to them. Being a member is the easiest way to be involved in our mission to preserve and share our state's rich history. Find out how! Volunteers work with staff members to support our mission. Keep an eye on job listings!